Travis Flora has spent 20 years at Commonwealth Credit Union ($1.2B, Frankfort, KY) immersed in the organization’s culture and values. Now, he’s in charge of them. Flora joined the credit union in 1996 and served in various marketing roles before taking on the newly created title and role of culture and values officer in April 2017. He’s in charge of the Team 1 Culture initiative that replaced the top-down, silo-heavy work environment of years past. Here, Flora describes what this new role is all about. Why did Commonwealth create this role? Travis Flora: Commonwealth worked with the Disney Institute in 2014 to create a new corporate culture. Our CEO of 35 years had stepped down, and we were in a state of transition. We had a traditional top-down environment that focused on not making mistakes, which led to silos, poor communication, and unclear direction. Our new president and CEO, Karen Harbin, wanted to create a culture that united us around a single vision and empowered each department and team member to use their strengths. I was one of the two dozen “champions” that worked with The Disney Institute to create this culture, which we called Team 1. That’s important to point out — our culture was created by us, for us. There was resistance to Team 1, especially from people who were comfortable in the old culture. Some opted to find their joy elsewhere. Others thought they would wait it out. A common thought was that the new culture would last until the initial enthusiasm wore off, and then we’d go back to the way things were. This position was created to make sure that didn’t happen. Did the credit union create this new role specifically for you? TF: It’s specific to our organization’s purpose. I was in the right place at the right time. I was a longtime employee who lived through the former culture and didn’t want to see us slide back to the way things were. As a champion and ambassador of the new culture, I saw the potential and how it could set us apart and propel our credit union to new success. When we rolled out Team 1 Culture, I was serving as a leadership intern. This gave me the opportunity to learn and evaluate processes, practices, and communication throughout the organization and look at things from a cultural perspective. Our president and chief human resources officer saw the value of committing my energies full time to promoting and growing our Team 1 Culture, so I transitioned to this new role. What made you a great fit for this job? TF: My undergraduate and master’s degrees in public relations and communications set a good foundation for this, but it was my 19 years in the marketing department at the credit union that made me a great fit for this job, both from theoretical and practical perspectives. I had relationships throughout the credit union and a reputation as being neutral and unbiased. Many have called me the Switzerland of our credit union. This allowed me to know what was going on throughout the credit union, spot and address trouble areas, shine lights on the success stories, and so on. Plus, while in marketing, I was basically a one-person production company and expanded our internal communications. In essence, we now have an internal marketing department, including video, digital signage, social media, print and electronic communications, and events, all designed to promote our Team 1 Culture. TF: I’m responsible for promoting and maintaining our Team 1 Culture at every level of the credit union, from the newest hires to our president and senior team. That includes coaching, mentoring, and teaching; surveys and research, including interpersonal department visits; communications such as print, digital, video, social media, and web; and events. Click here to see Travis Flora’s complete job description. Find this and other job descriptions, policy templates, and more shared by credit union executives from around the country in Callahan’s Policy Exchange. 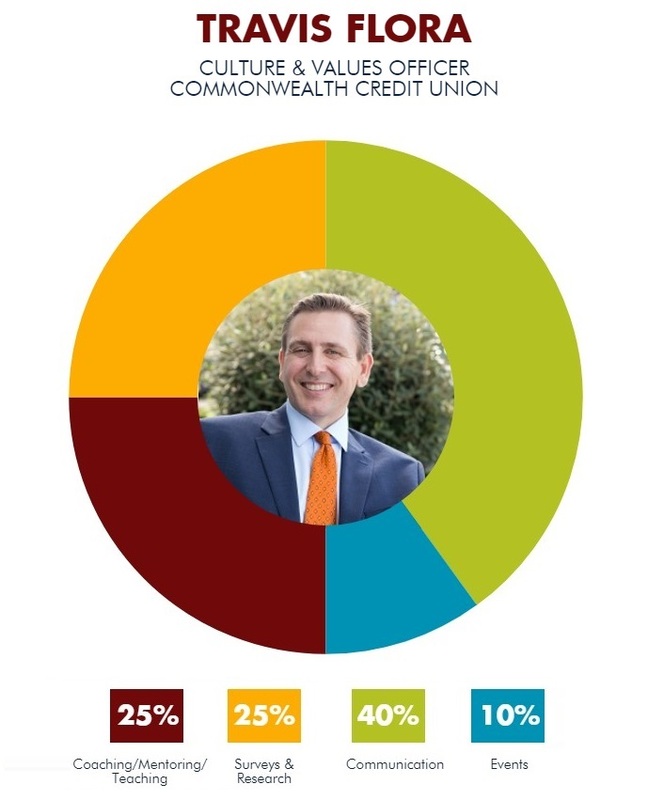 Learn more at the Connect Center on CreditUnions.com. TF: That depends on the day. I typically start the day on social media. I catch up on what’s going on with our team members because good culture begins with good relationships. 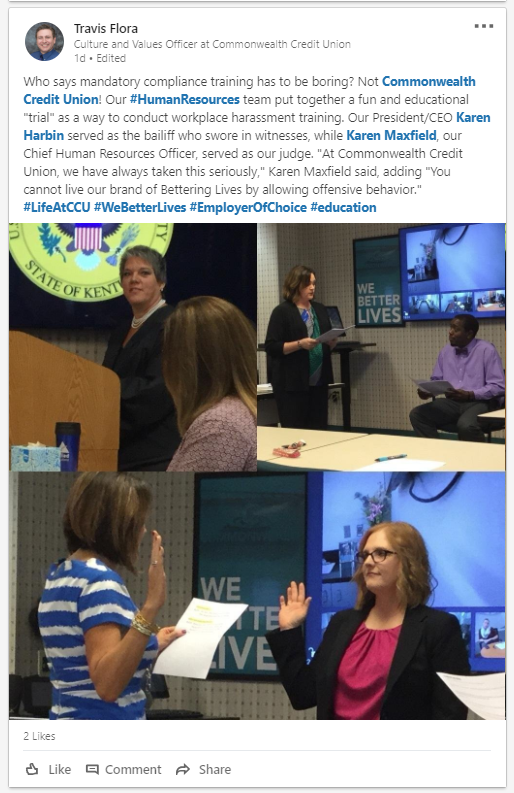 I post pictures and articles on the credit union’s LinkedIn, Twitter, and Instagram culture pages with a “LifeAtCCU” hashtag. These pages focus on staff activities and success stories and are different from the pages operated by our external marketing team. Every other Monday, I lead a Culture Day for new hires. This is the first thing they experience. We go over our Team 1 Culture in a way that is educational, fun, and inspiring. We’re consistently told this is the best first day experience new employees have ever had. It’s important they know the expectations for team members, so we ask them to sign a Culture Commitment at the end of the session. Commonwealth Credit Union takes the boring out of mandatory compliance training. The credit union’s HR team hosted a mock trial to educate employees about workplace harassment. Besides that, I spend a lot of time on communication. I create our monthly newsletter, for which staff and members submit stories that promote our values and quality standards. Positive reinforcement is important to our culture, so it also includes messages from our president and board, as well as minutes from the prior month’s management team meeting. Transparency is a big goal of communication. We operate a digital signage system in our back-office areas that includes motivational quotes from our staff, pictures of new team members, staff promotions, staff events, and a reminder of our daily Team 1 Culture huddle word. We have a different word every day that each department discusses. I also spend time working on surveys. We spend a lot of energy making sure the right people have input on the various projects we have going on. Finally, and most importantly, I spend as much time as possible visiting branches and interacting with staff at all levels. These visits are a great way to find positive things that we want to reinforce. I talk with managers on a regular basis to find out how things are going and brainstorm ways to engage staff or address conflicts. I also work with various project teams, such as our Leadership Development Committee, Vision Day Committee, recognition team, and mentoring group. TF: Culture is such an intuitive thing, so much of it is “gut feeling.” I talk to people and, more importantly, I listen. I also collect data. We conduct surveys as part of our team member onboarding to identify hiccups early. Exit surveys are also important to determine why people leave. I also conduct an annual employee engagement survey to identify trends within the workplace, areas of improvement for our leaders, ways to improve our organization, and whether our team members feel engaged and empowered. What’s A Diversity & Inclusion Officer? TF: I report to Karen Maxfield, our chief human resources officer. I am a department of one, but I use a variety of team members to work on special projects. This approach keeps team members engaged and involved with the culture. I am similar to human resources in that I am responsible for all 300-plus team members. Travis Flora, the culture and values officer at Commonwealth Credit Union, maintains a mix of professional, personal, and spiritual reading to promote mind/body/soul balance. He’s currently reading “Servant Leadership in Action,” by Ken Blanchard and Renee Broadwell; here are other selections from his professional resource list. TF: Leaders are readers, and I read extensively. I maintain a mix of professional, personal, and spiritual reading to promote mind/body/soul balance. Do you know of anyone else with a similar role or title? TF: I just met someone via LinkedIn — Jon Sexton, senior vice president of culture and leadership development at Vibrant Credit Union.